For almost 20 years we have been offering you high quality First Communion clothes for girls and boys. We have already sewn thousands of communion albs and dresses for many parishes in Poland and abroad. 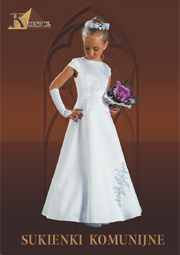 Every year we work on new designs; in the nearest First Communion season we offer almost 100 models of albs and dresses. We know how important the First Communion celebration is for a child and the whole family, therefore we do our best to carefully prepare our products in every detail. Albs and dresses offered by our company are aestheticly made of good quality materials and have interesting design. Furthermore, our clothes are sewn according to a very detailed size chart, which guarantees that the size is well-matched to your child. We cooperate directly with parishes and schools, providing First Communion albs and dresses for organized groups of children. We encourage you to place group orders, which will allow us to prepare ourselves for celebrations more efficiently and are a guarantee of attractive prices. We send orders by mail or we come to the group within a limited area.